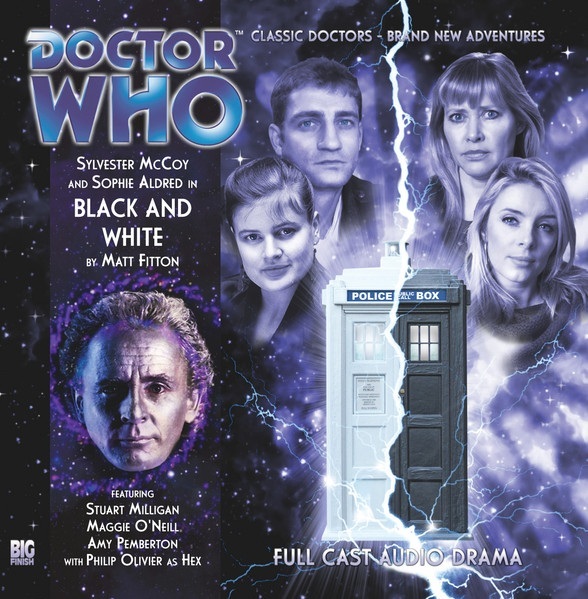 Following the sensational ‘Protect and Survive,’ ‘Black and White’ continues this latest Seventh Doctor trilogy with a tale that finally offers answers to questions that have been building since Hex’s first appearance. Fitting in Doctor Who’s take on the Beowulf legend as the monstrous Garundel ravishes the kingdom of Hrothgar, ‘Black and White’ comes precariously close on multiple instances of collapsing under its own weight and ambition but ultimately tells a very intriguing story that sets up the final story of this trilogy incredibly well. As the companions follow in the Doctor’s wake, trying to prepare for the oncoming battle in the process, the flashback sequences that show the Doctor secretly raising the black TARDIS from a childhood-like state in order to run side missions without Ace and Hex knowing are brilliantly realized. The Seventh Doctor is no stranger to darker inclinations, but these actions while knowingly bringing the black TARDIS closer to its demise in the final battle are unquestionably some of the darkest actions he’s ever undertaken and significantly heighten the overall severity and menace of the threat at hand. Even as allusions to Fenric continue to mount, the threat manifesting through Nordic bloodlines a rather pointed comparison, ‘Black and White’ still spends ample time with its Beowulf component as well. With Hex and Sally encountering the legendary king near the end of his life and Ace and Lyssandra encountering a much more youthful version, even this component takes effectively unpredictable turns, and the close interconnectedness of truth and fiction is explored to great effect within the confines of the king’s life. Though Michael Rouse may go just a little too over the top as the young king, Richard Bremmer touchingly exudes the temper of age as required, and Stuart Milligan’s alien Garundel is just nuanced enough to fit in tonally with these harrowing events. As Sylvester McCoy is once more largely absent from this story due to his filming obligations for The Hobbit, Aldred and Olivier masterfully carry their second story in a row. At the same time, O’Neill and Pemberton each give suitably strong performances that exemplify why the Doctor chose those two to join his crusade. And although there is definitely too much going on for every aspect to be explored sufficiently, McCoy’s flashback scenes are unquestionably some of the highlights of this release, proving once more that Big Finish and its authors are perfectly able to successfully work around unexpected hurdles. It would have been nice to see the discussion of reality and fiction tied into the storyline of the companions and Doctor as well, but the end result is still a very strong effort that rewards long-time Big Finish listeners and sets up the highly-anticipated conclusion very effectively.